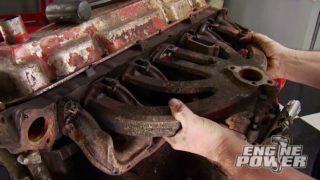 (ANNOUNCER)>> FROM JUNKYARD TO SHORT BLOCK, IT'S MOPAR MAGIC TODAY ON ENGINE POWER. (MIKE)>> WELCOME TO ENGINE. 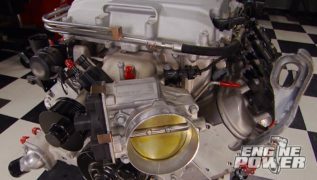 TODAY WE'RE TAKING CARE OF ALL OF YOU MOPAR FANS WITH AN RB, OR RACE BLOCK, BIG BLOCK BUILD THAT'S GONNA USE THE LATEST PARTS IN TODAY'S AFTERMARKET. 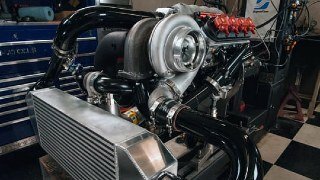 (PAT)>> WE SATISFIED YOU BIG BLOCK CHEVY FANS BY BUILDING A 572 INCH ANVIL THAT MADE 750 HORSEPOWER ON GAS RIGHT OUT OF THE PUMP. 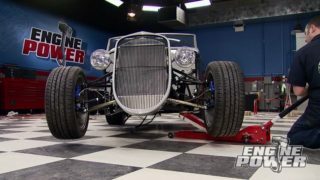 THEN WE SURPRISED THE BIG BLOCK FORD CROWD WITH A 557 INCH BLUE OVAL BAD BOY THAT GOT THE INTERNET BUZZING. 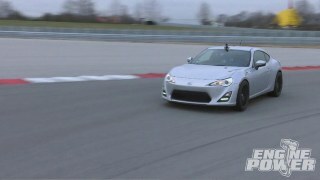 IT MADE 754 HORSEPOWER NATURALLY ASPIRATED. THEN WE SPRAYED IT WITH A 300 SHOT OF NITROUS TO LAY DOWN AN IMPRESSIVE GRAPH ON OUR SUPER FLOW. 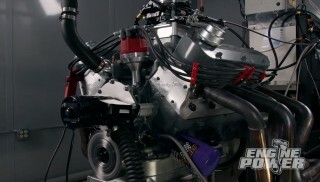 (PAT)>> 1,080 ON POWER AND 1,119 ON TORQUE, AND STILL ON PUMP GAS, ALL WITH A GIRDLED TWO BOLT MAIN STOCK BLOCK. (MIKE)>> JUST LIKE A LOT OF YOU, WE NEEDED A SUITABLE CORE TO START WITH. SO WE MADE A CALL TO THE MOPAR PROFESSIONALS AT STEPHENS PERFORMANCE DOWN IN ANDERSON, ALABAMA. NOW WE TOLD THEM OUR PLANS FOR THIS ENGINE AND THEY JUMPED AT THE OPPORTUNITY TO HELP US OUT. THEY PULLED THIS 440 OUT OF A PARTS CAR, DISASSEMBLED IT TO MAKE SURE THE BLOCK HAD NO OBVIOUS DAMAGE. THEN SENT US EVERYTHING IN A COUPLE OF BOXES. WHEN IT WAS ASSEMBLED. THE CRANK SHAFT'S CASTING NUMBER IS TWOTWOZEROSIXONESIXZ ERO, MAKING IT A FORGED STEEL PIECE. WE'RE STROKING THIS ENGINE TO OVER 500 CUBIC INCHES. SO WE'LL PUT THIS ONE IN OUR PARTS CAGE FOR ANOTHER BUILD DOWN THE ROAD. NOW WE CAN SEE THE CASTING NUMBER THAT DESIGNATES THIS BLOCK AS A 1966 TO 1972, AND THE ACTUAL CASTING DATE IS RIGHT ABOVE IT, 12/21/1971. SO THIS BLOCK IS FROM 1971. 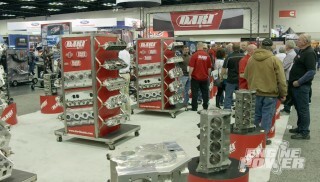 FOR ONE OF THE BIG POWER PRODUCING MUSCLE CAR ENGINES. NOW IT'S OFF TO SHACKLETT'S AUTO MACHINE TO GET ITS FRESHEN UP. 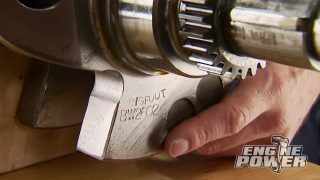 BULLET, WE'RE GONNA TREAT IT ACCORDINGLY, WHICH STARTS WITH A DIE GRINDER AND CARBIDE BURR TO REMOVE CASTING FLASH FROM THE LIFTER VALLEY. THESE THING AREAS ARE KNOWN TO BREAK OFF AND MIGRATE RIGHT TO THE OIL PUMP. SO WE'RE GETTING RID OF THEM. NEXT UP WE'LL SMOOTH THE OIL INLET ON THE BLOCK ALONG WITH THE OIL HOLES FEEDING THE MAINS. REMOVING SHARP EDGES ANYWHERE OIL FLOWS REDUCES TURBULENCE, WHICH INCREASES FLOW. AND FOR GOOD REASON. IT ALLOWS US TO CHUCK IT UP IN A DRILL SO THE GALLERIES CAN BE CLEANED FASTER. WITH A SQUIRT OF WD 40 ON THE BRISTLES LET THE CLEANING BEGIN. WORK THE BRUSH THE ENTIRE LENGTH OF THE GALLERY. THE PURPOSE IS TO LOOSEN UP ANY FOREIGN MATTER THAT COULD BE IN THEM, BUT DON'T STOP THERE. MAKE SURE YOU CLEAN EVERY OIL PASSAGE POSSIBLE, HENCE THE DIFFERENT SIZE BRUSHES IN THE KIT. (PAT)>> THE FINAL STEP IS TO WASH THE ENTIRE BLOCK. WE'LL BE RIGHT BACK. WHICH SHOWS US THEY HAVE EXCELLENT QUALITY CONTROL. PLUS THEY'RE FINISHED ON AMERICAN MADE SONNEN EQUIPMENT FOR SUPER TIGHT TOLERANCES. THESE FORGED PISTONS ARE MADE FROM 2618 TSIX ALUMINUM FOR SUPERIOR STRENGTH WITHOUT SACRIFICING WEIGHT. NOW THEY HAVE A 16TH, 16TH, THREESIXTEENTHS RING GROOVE, AND THE OIL RETURNS ARE DRILLED. NOW UP TOP THE VALVE RELIEFS WILL WORK WITH THE CAM SHAFT UP TO ABOUT 700 INCH LIFT. UNDERNEATH THE PIN IS A BIG BLOCK CHEVY 990 DIAMETER. NOW IF YOU LOOK CLOSE YOU CAN SEE REINFORCEMENT RIDGES IN THE FORGING, WHICH JUST ADDS EXTRA STRENGTH TO THE PISTON. NOW THE SKIRTS ARE DIAMOND FINISH WITH A TOLERANCE OF PLUS OR MINUS TWO AND A HALF 10 THOUSANDTHS. THESE ARE 30 OVER PISTONS FOR A FINAL BORE SIZE OF FOUR-350. ONENINENINETHREE AND THEY ALSO HAVE BETWEEN 30 AND 32 TEN THOUSANDTHS CLEARANCE. SO THEY'RE IN THE GREEN AS WELL. THIS IS A STEP THAT NO ONE SHOULD EVER SKIP. THERE'S IS NO GUESS WORK IN ENGINE BUILDING. (MIKE)>> ENGINE BLOCKS NEED A LITTLE FACE LIFT AFTER MACHINING. WE'RE SPRAYING THIS ONE WITH DUPLICOLOR ENGINE ENAMEL WITH CERAMIC. IT WITHSTANDS TEMPS TO 500 DEGREES AND IS OIL AND FLUID RESISTANT. THE COLOR IS CHRYSLER BLUE. NOW CLEVITE MAIN BEARINGS ARE LAID IN, AND GET SLICKED UP WITH A HIGH VISCOSITY ASSEMBLY LUBE. ULTRA TORQUE, AND THE THRUST IS CHECKED. WE HAVE FOUR THOUSANDTHS, WHICH TURNS ON THE GREEN LIGHT TO CONTINUE. GONNA USE SILICONE. WITH IT IN PLACE WE CAN TAP THE RETAINER ALL THE WAY DOWN AND TIGHTEN THE BOLTS. THE FUN HAS JUST BEGUN, SO STAY WITH US. THE LOBE SEPARATION. IN THIS CASE, 112 DEGREES. THE PISTONS ARE NEXT, AND THE PINS ARE SECURED WITH A SINGLE SPIRAL LOCK ON EACH SIDE. WE'VE ALREADY FILE FIT THE RINGS WITH THE TOP HAVING A 20 THOUSANDTHS GAP, THE SECOND HAVING A 22 THOUSANDTHS GAP, AND THE OIL RAIL'S GAP ARE 18 THOUSANDTHS. USING ASSEMBLY OIL, WE'LL PRELUBE THE RINGS AND SKIRTS OF THE PISTON. APPLY ASSEMBLY LUBE ON THE BEARING AND DROP THE ASSEMBLY IN. A FEW LIGHT TAPS WILL GET THE RINGS IN THE BORE. 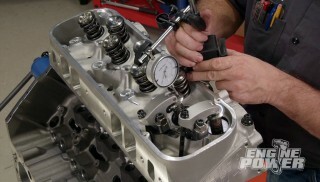 (MIKE)>> DOWN LOW THE CAP CAN GO ON, AND IT GETS SNUGGED DOWN WITH ARP 8740 ROD BOLTS. WITH ALL EIGHT INSTALLED THEY'LL GET TORQUED TO 60 POUND FEET. NOW THE OIL PICK UP IS THREADED IN. IT'S A MATCH TO OUR OIL PAN THAT GOES ON SOON. 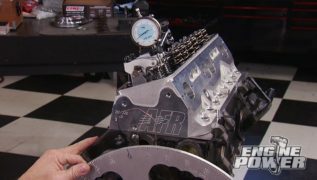 THE SUMMIT RACING TIMING COVER CAN GO ON NOW, ALONG WITH THE MILODON WINDAGE TRAY. TO SEAL UP THE BOTTOM END THIS MILODON SEVEN QUARTER LOW PROFILE PAN. IT FITS '64 AND EARLIER "A", "B", "C", AND "E" BODIES. ARP FASTENERS WILL SECURE IT. WE'RE INSTALLING A SUMMIT RACING SFI APPROVED BALANCER WITH OUR MATCO INSTALLER. LIKE ALL OUR ENGINES, WE'RE VERIFYING TDC AND ALIGNING THE POINTER WHERE IT'S SUPPOSED TO BE. THE RB'S OIL PUMP IS EXTERNALLY MOUNTED. 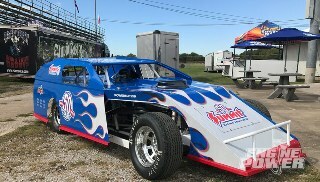 THIS IS A MELING HIGH VOLUME UNIT WE PAINTED CHRYSLER BLUE TO MATCH THE BLOCK. 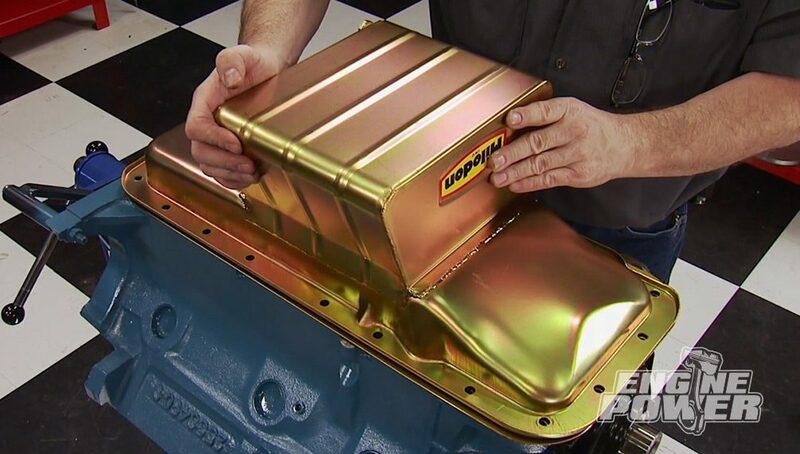 PART ONE OF THIS BUILD WENT FROM THIS GRUNGY BLOCK NEEDING SOME ATTENTION TO THIS EYE CATCHING COMPLETE SHORT BLOCK THAT ANY MOPAR FAN WOULD CLICK HIS HEELS TWICE AND MAKE A WISH FOR. WE HAVE A LITTLE TIME LEFT BUT IT'S NOT FOR THE MOPAR. 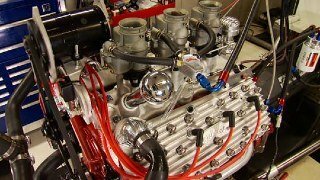 NOW JUST SO YOU KNOW, PART TWO WILL INCLUDE A BRAND NEW TOP END PACKAGE FROM TRICK FLOW THAT WILL ALLOW US TO MAKE SOME SERIOUS POWER. PLUS IT'S GETTING ELECTRONIC FUEL INJECTION. 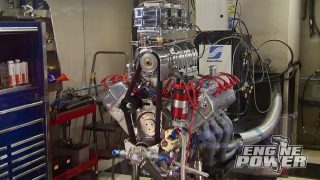 NOW WE PREDICT THIS ENGINE WILL CRACK THE 600 HORSEPOWER MARK WITHOUT ANY PROBLEMS. 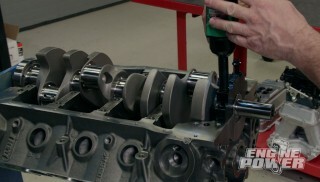 (PAT)>> AND PROBLEMS ARE WHAT YOU WANT TO AVOID IN ENGINE BUILDING. NOT JUST BECAUSE OF THE COST, BUT THE TIME AND EFFORT THAT GOES INTO A QUALITY BUILD. 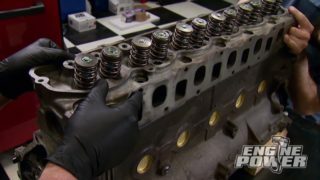 NOW AFTER THE BREAK WE'RE GONNA TAKE YOU BEHIND THE SCENES AND SHOW YOU HOW MIKE AND I PLAN ALL OF OUR ENGINE BUILDS, STARTING WITH THE SHORT BLOCK. PURPOSES BUT WE ARE ALWAYS PREPARED THAT A STRUCTURAL FAILURE COULD OCCUR. AFTERMARKET BLOCKS ARE PURPOSE BUILT WITH STRONGER MATERIALS, MORE ACCURATE MACHINING, AND ARE DESIGNED TO WITHSTAND THE STRESSES OF HIGH PERFORMANCE APPLICATIONS. WITH THE BLOCK SELECTED THERE'S STILL A LOT TO CONSIDER AND WE'RE GONNA GET TO THAT NEXT TIME. AND WE UNDERSTAND THAT FUNDS DICTATE PROJECTS. SO SPEND YOUR MONEY WISELY AND PLAN ACCORDINGLY AND YOU CAN HAVE A GREAT RUNNING ENGINE THAT WILL LAST. AND EARTH FRIENDLY. NOW IT'S REALLY COOL BECAUSE IT DOES THE WORK FOR YOU. SIMPLY SUBMERGE YOUR RUSTY PARTS IN IT AND LET IT SIT OVERNIGHT. NOW HERE'S AN EXAMPLE. HERE'S A BEFORE AND AFTER ON AN OLD RUSTY INTAKE MANIFOLD, AND I'VE GOT TO SAY WE'RE IMPRESSED WITH THE RESULTS. NOW ONE GALLON WILL TREAT UP TO 300 POUNDS OF STEEL. SO NEEDLESS TO SAY, A LITTLE GOES A LONG WAY. NOW IT CAN BE REUSED TIME AND TIME AGAIN UNTIL IT TURNS BLACK. THAT'S WHEN YOU KNOW THE FLUID IS SPENT. NOW ONE GALLON WILL RUN YOU ABOUT $22 BUCKS AT ANY OF YOUR LOCAL AUTO PART STORES. 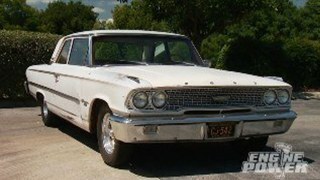 (PAT)>> DO YOU REFER TO BOTH YOURSELF AND YOUR RIDE AS A SPIRITED DAILY DRIVER? WELL POWERSTOP BRAKES HAS A SETUP THAT'S RIGHT UP YOUR ALLEY. THIS IS THEIR Z-23 EVOLUTION SPORT ONE CLICK BRAKE KIT, AND IT CONTAINS AN ENGINEERED COMPONENT PACKAGE THAT CAN EASILY HANDLE YOUR PERFORMANCE DRIVING STYLE. THE KIT HAS THEIR EVOLUTION PERFORMANCE BEVEL DRILLED, ROUND SLOTTED, ZINC PLATED AND MILL BALANCED ROTORS THAT ARE MADE WITH TRUE CAST TECHNOLOGY AND CAN RUN UP TO 180 DEGREES COOLER THAN OEM ONES. ALSO INCLUDED ARE THESE Z-23 EVOLUTION SPORT PADS MADE FROM A CARBON CERAMIC FORMULA THAT GIVES BETTER BITE WITHOUT THE NOISE AND DUST. PREMIUM HARDWARE AND LUBE IS INCLUDED AND YOU CAN GO TO POWERSTOP DOT COM TO FIND YOUR APPLICATION AND BUY THE ENTIRE KIT WITH JUST ONE CLICK. 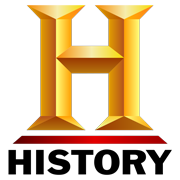 (MIKE)>> HERE'S ONE THAT COMES UP A LOT. (PAT)>> IT'S A GOOD ONE. THE ENGINE IS GOING TO BE USED IN. TYPICAL COMMERCIAL FUELS ARE IN THE 80 TO MID 90 OCTANE RANGE. (MIKE)>> SO WHAT DO THE 87, 89, 91, AND 93 NUMBERS THAT YOU SEE ON THE PUMP MEAN? WELL THE HIGHER THE NUMBER THE SLOWER THE BURN RATE OF THE FUEL. NOW FASTER BURN RATES PRODUCE HIGHER CYLINDER TEMPERATURES, AND HIGHER CYLINDER TEMPERATURES ARE WHAT LEAD TO DETONATION OR KNOCK. NOW HERE'S AN FYI. DETONATION IS THE AUTO IGNITION OF THE AIR/FUEL CHARGE AFTER THE SPARK PLUG GETS A CHANCE TO IGNITE IT. CHECK THIS OUT. FUEL'S MOTOR OCTANE RATING, IT WILL IGNITE PART OF THE AIR/FUEL CHARGE NANO SECONDS AFTER THE SPARK PLUG FIRES AND LIGHTS THE OTHER PORTION OF THE MIXTURE. THE TWO REACTIONS BOTH PRODUCE A FLAME FRONT THAT PROPAGATES FROM TWO DIFFERENT AREAS OF THE CHAMBER, AND WHEN THEY COLLIDE THEY WILL PRODUCE AND AUDIBLE KNOCK, OR PINGING SOUND, AND THE RESULT IS A SPIKE IN PRESSURE AND TEMPERATURE IN THAT SAME CYLINDER, MAKING IT EVEN MORE SUSCEPTIBLE TO THE SAME REACTION ON THE NEXT COMPRESSION CYCLE. AND IF ALL THE CYLINDERS ARE DOING THIS, IT WILL LEAD TO CATASTROPHIC ENGINE FAILURE LIKE DESTROYED PISTONS AND ENGINE BEARINGS. PLUGS, WHICH TAKES A LITTLE BIT OF EXPERIENCE. DETONATION WILL LEAVE TELLTELL SIGNS ON A SPARK PLUG SUCH AS SMALL FLECKS ON THE PORCELAIN ALL THE WAY TO A LIGHT GRAYISH COVERING OF THE ENTIRE PART OF THE PLUG THAT SITS INSIDE THE COMBUSTION CHAMBER. NOW BOTH ARE EXAMPLES OF VAPORIZED ALUMINUM FROM THE TOP OF THE PISTON OR THE COMBUSTION CHAMBER. THAT IS AN INDICATOR THAT A HIGHER OCTANE FUEL AND A BETTER TUNE UP IS NEEDED. NOW WHEN WE NEED AN OCTANE INCREASE AND DISTILLED RACING FUEL IS JUST NOT AN OPTION, WE TURN TO A PROVEN PRODUCT WE KNOW WORKS. RACE GAS IS A CONCENTRATE YOU MIX WITH PUMP GAS TO REACH A SAFE OCTANE LEVEL, ALL THE WAY UP TO 105. (PAT)>> WELL SCHOOL'S ALL DONE FOR TODAY. SO GO MAKE SOME NOISE WITH THE BOYS AND KEEP BUILDING TOYS. IT'S JUST WHAT WE DO. SEE YOU NEXT TIME.